Review: This film is set about six or twelve years after the civil war in Wyoming during the winter. A bounty hunter and his fugitive Daisy Domergue are on their way to the town of Red Rock. On the way they pick up two strangers. They stop overnight and take shelter at Minnie’s Haberdashery where they are greeted by a group of nefarious characters. The characters that want to get to Red Rock soon realize that they might not make it there. The opening scene was extraordinary with all the scenery. I would have liked to have seen more of the scenery and actually quite missed it after a while. As well as enjoying the scenery I also thought that the music was very good and very well composed. All the performances were amazing especially the lead actress Jennifer Jason Leigh. I did think that the script was very well written and laughed out loud a few times. 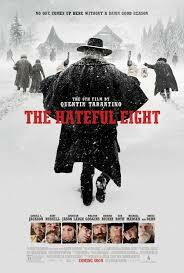 As good as director Quentin Tarantino is, the only problem that I have is that I do find his films rather too long. There could easily have been 30 minutes cut from this film. They had an early test screen of this film which ran over 3 hours and also included an intermission. You have got to give yourself about 3 hours in the cinema. At the beginning of making this film the script was leaked and went online. Quentin Tarantino then refused to direct the film, then changed his mind. Viggo Mortensen was in talks of playing one of the characters but had to drop out due to scheduling conflicts. I did lose concentration a bit during the film. Warning this is a very bloody and gory film. At the Golden Globe Awards in 2016 this won Best Original Score – Motion Picture. At the Bafta Awards in 2016 this won Best Original Music. At the Academy Awards also in 2016 this won one Oscar and that was for Best Original Score.